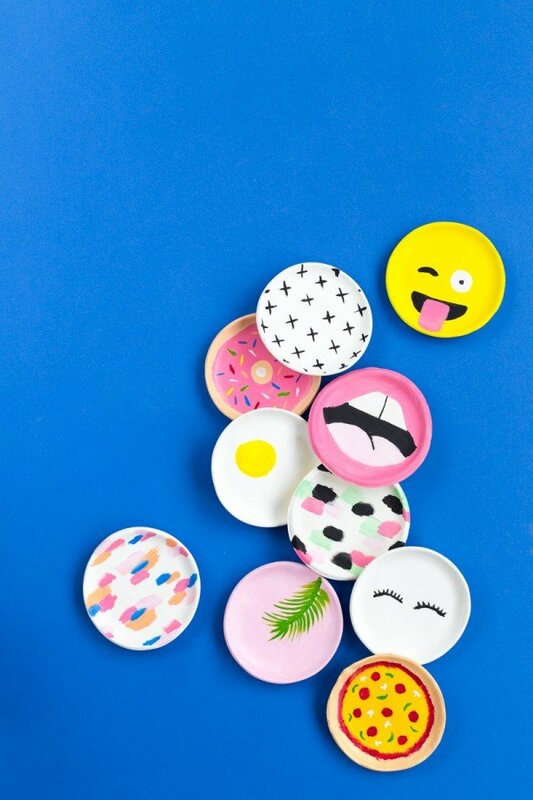 Trinket dishes are both fun and functional, and they are more than just decorations on top of your desks and tables. You can get some fancy dishes from home decor and souvenir shops to use as trinket dishes, but you might also want to have them personalized or DIYed. If you have a few outdated mini bowls that are made out of clay, you can breathe new life into them by having a makeover. Get your paintbrushes ready, as well as your acrylic craft paints (off-white, gold, and forest green) and pencil. First, you need to paint the bottom of the dishes with gold craft paint then let them dry. Next, Draw leaf-like patterns on top of the mini bowls then fill them in with forest green acrylic paint. Lastly, fill in the rest of the space with off-white paint then let dry. You may or may not want to spray sealant afterward to protect your work. 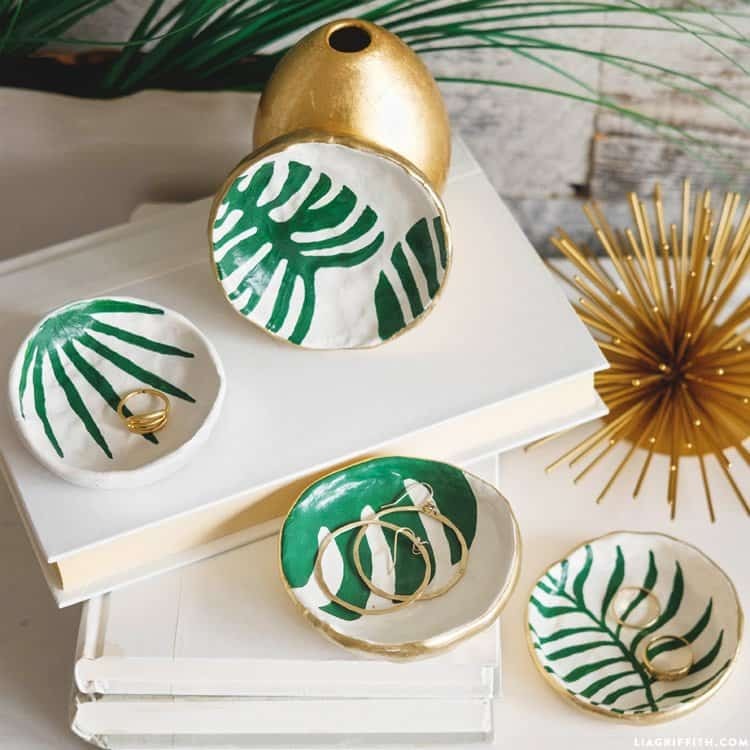 These upcycled mini bowls can bring a refreshing tropical vibe to your vanity or office desks. Pair with gold accessories and supplies for that extra glam. For that pearly, vintage-y touch to your old vanity dresser, save some oyster shells and turn them into these elegant-looking, fit for a queen trinket dishes. First step — rinse and dry the oyster shells. Next, glue faux pearls underneath to make the oyster shells stand and to keep them from moving. Voila! 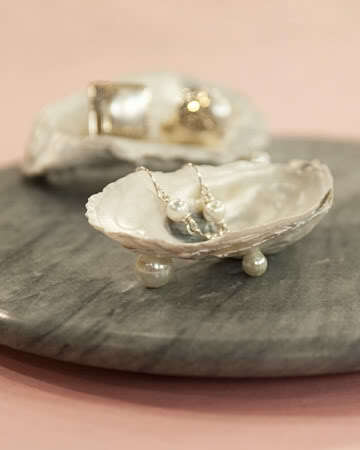 Trinket dishes made from oysters! 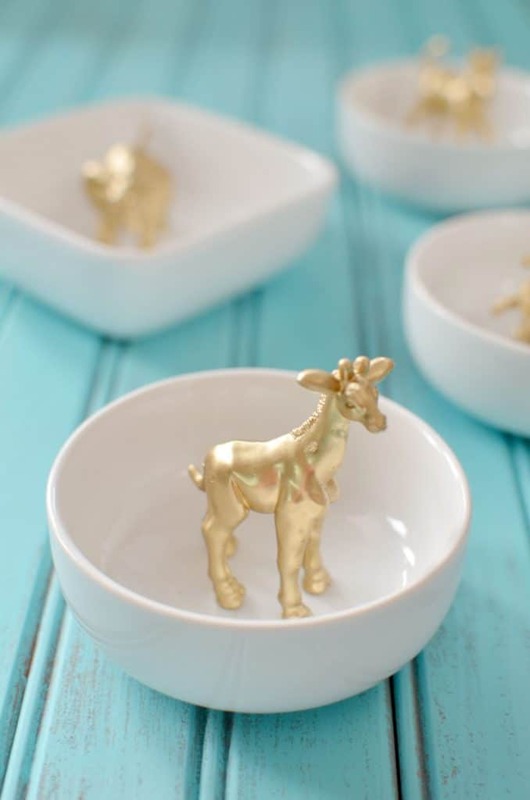 These DIY animal ring dishes look so cook yet they are so affordable and easy to make. You will need white mini bowls (round or square), plastic animals (choose the ones that will fit perfectly inside the ceramic bowls), gold spray paint, and E6000 glue. First, pick out the plastic animals that you want to use. You can actually get from your old toy stash so you won’t need to buy new ones. Spray paint the animals gold and let them dry. Make sure to cover all the areas, including all the nooks and crannies. Two to three coats are good. Once the animals are dry, put glue on the feet of the plastic animals and position them in the bowls. Animals that are taller than the bowls looked really awesome. Use may also other colors of spray paint if you want to use these in the classroom or you want to give them as gifts. 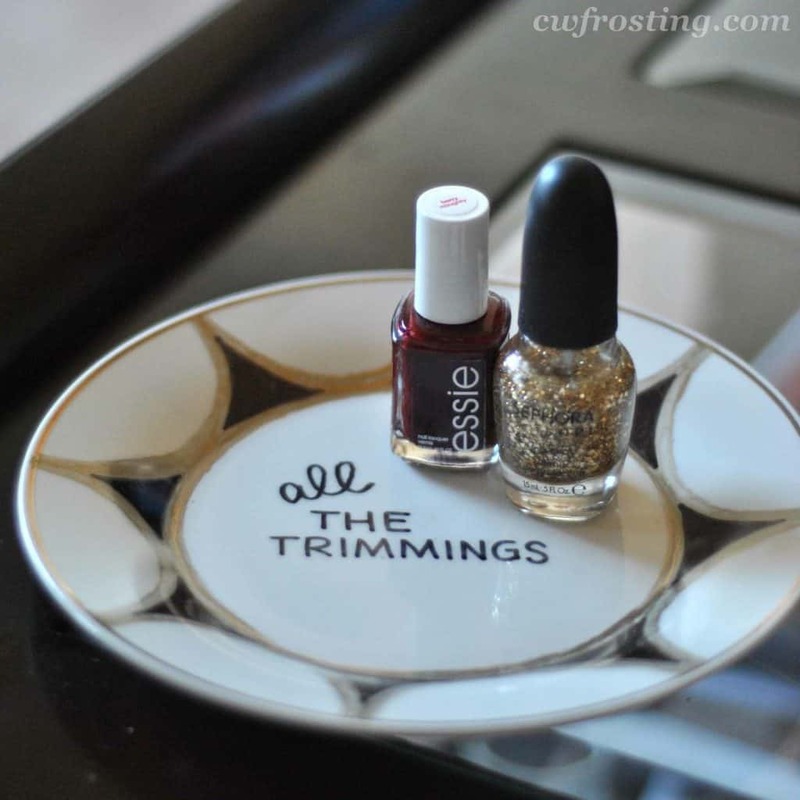 This DIY trinket tray is perfect for catching small items in your vanity, bathroom, or entryway. You will need 5 pieces of gold macrame hoops, a round mirror (same size as the gold macrame hoops), and E6000 glue. 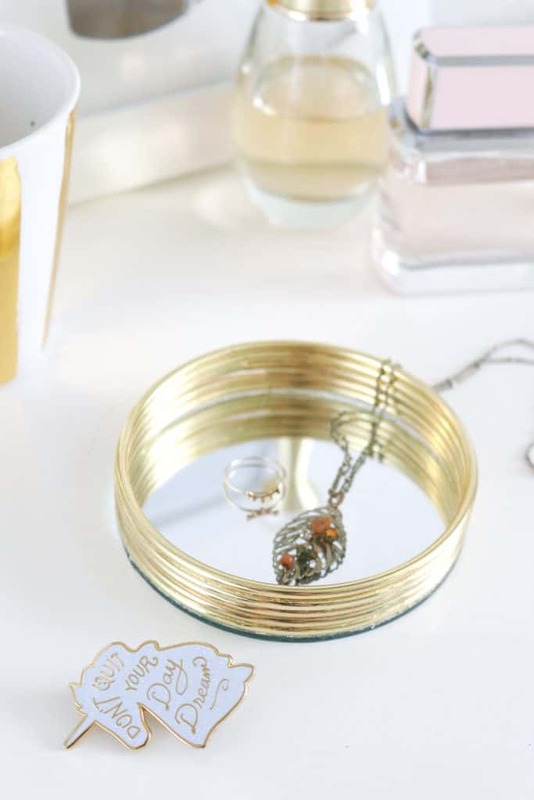 Start with adding glue all the way around the edge of the top of the mirror and press one gold macrame hoop on top. Repeat this five more times, stacking the hoops on top of each other. Within minutes, you have a new trinket dish! Just make sure not to drop it ’cause the mirror might break. You can also make larger versions of this project for larger items. Do you know Model Magic? 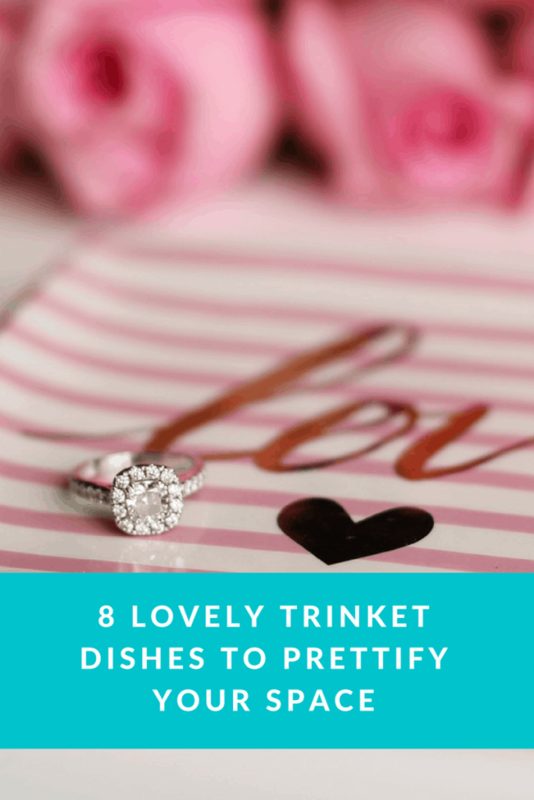 If you do, you can make simple trinket dishes from it with just a bit of creativity. You will use Model Magic, cookie cutter, disposable bowl, rolling pin, craft paint (different colors) and wax paper. First, get a piece of Model Magic. The size depends on how large or small you want your trinket dish to be. Next, use the rolling pin to flatten it a bit on wax paper, then use a cookie cutter to cut out a circle. Place the circle in the bottom of the disposable bowl, making sure the edges turn a bit upward. Place upside down and let it dry completely. After drying, paint it with whatever design you want using craft paint. These DIY trinket dishes will make great gifts or wedding souvenirs. If you have an extra plate that you have no use for, transform it into an art deco by using a Sharpie marker or any permanent marker. First, clean the plate, draw with Sharpie (choose your design and colors), then bake at 350°F for 30 minutes. Place the plate on top of your desk to hold your precious little things. 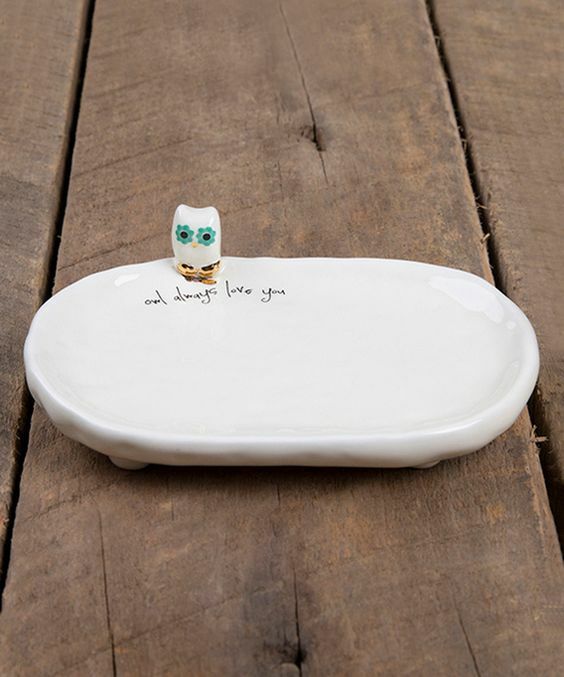 Grab a ceramic dish, a tiny animal toy, craft paints, E6000 glue, and a fine tip permanent marker and you’ll get this cute trinket tray that’s worthy of everyone’s attention. Choose an animal, or a small thing that you’re fond of, then paint it and let dry. Glue the animal near the edge of the dish. Get a fine tip permanent marker and write a short quote or your favorite mantra. 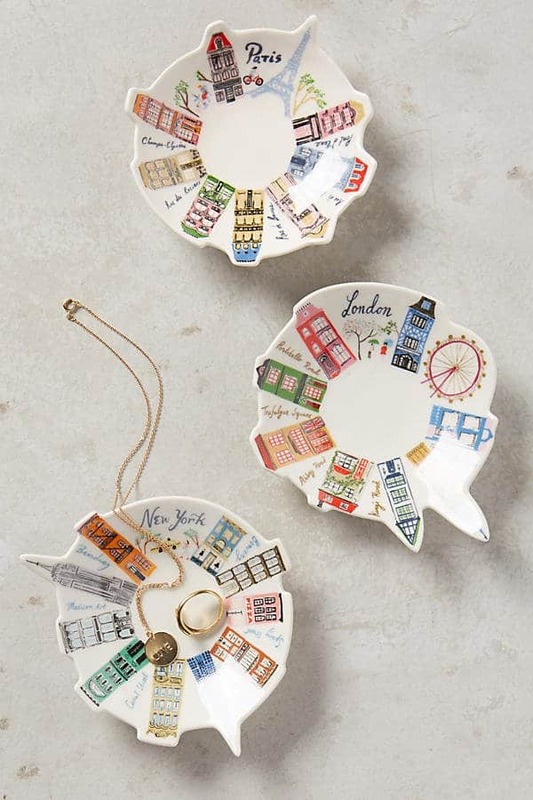 This travel-inspired trinket dish from Anthropologie is anything but boring. If you love going places and discovering new frontiers, this is the design for you. You can get it from their online shop or you can make your own with a ceramic dish and colored fine tip markers or craft paint. Trinket dishes can definitely prettify your space and can add a little bit of interest when placed on a table. You can shop online for different designs and materials, but you can also make your own trinket dishes and upcycle old plates and little trays to make them useful again. It’s always good to have a personal touch on your stuff and we hope that list inspired you to try making your own crafts at home.